Children are fascinating, beautiful creatures that seem to grow and change in the blink of an eye. First, your child is an infant; always growing, but still so fragile. Fast forward a few years and they have nearly quadrupled in size and are more curious than they are dependent. And only a few years after that, they become teenagers; settling into their uniqueness and becoming independent. At each and every stage they experience curiosities, wonder and discovery. That is why science gifts and toys for kids can make some of the most outstanding choices. Throughout these years, children experience many changes in their bodies, minds, emotions, and development. Each stage of childhood brings its own level of progress; with each checkmark on the development-list being one more step closer to adulthood. And just like children’s clothes, everyday items, and their essential needs, their gifts and toys should suit these stages of development. Infant: During infancy children are not only in need of constant care, but they are also always changing. In a short time-span, babies use all of their senses to start to learn about the world around them. They go through many physical-growth changes and are typically always on the move (once they figure out how to move). The infancy stage covers ages 0-18 months, roughly. Toddler: From 18 months- 2 years, kids move into a really active stage. They are beginning to develop personalities and unique traits. Kids in this stage are always on the move, typically pushing boundaries. Preschool: When children reach around 3 years of age, they are still busy, but with more controlled actions. They learn a serious amount of information during this time, but their curious minds are designed to absorb every bit of it. Preschoolers typically ask non-stop questions until about 5 years of age. Adolescent: During a child’s adolescence they are adjusting to school life, becoming involved with activities, and becoming more social. Kids during this stage are adjusting to their growing, mature minds. You can expect this stage until roughly age 9. Preteen: The preteen years are a tumultuous time in which kids are usually discovering their own selves. They go through many physical, emotional, and hormonal changes, and they may feel misunderstood often. Preteens become teenagers at 13-years-old. Teenager: This can also be a challenging time for kids, since these huge changes are still occurring. But by this stage, kids are immersed in their hobbies and friends; becoming more independent by the day. When considering a gift or toy for any-aged child, you need to first consider what their age group is interested in, and what they need. Luckily, science is a topic that children of all ages are interested in. Not only does science cover a broad array of sub-topics, but it also allows the possible for any activity a child finds fun, or entertaining. Science can be fun, hands-on, educational, essential to development. The following 10 science toys for kids include a toy for every stage of development, and are sure to keep your curious child busy. This fun, little jar is suitable for kids and adults ages 4 and above. It should be noted however, that younger children should be supervised during use. Insta-Snow is a great STEM-related activity that be used over and over again. The jar can easily make around 2 gallons of fake snow, through the use of science. The special, polymer-based substance turns to white powder when water is added to it. Children can watch the jar erupt with snow in seconds. The polymer substance is ultra-absorbent, and can expand up to 100x its original size. 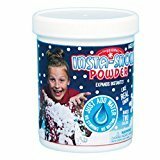 In addition to the 100-grams of Insta-Snow, the company includes an activity guide that not only has instructions, but also teaches children to science behind the snow. This hands-on experiment is educational and fun for most kids. It can be used as experiments, in demonstrations, in sensory tables, or in science fairs. The possibilities are endless with Insta-Snow. Nature, animals, rocks, and everything about the world is fascinating to children of all ages. Rocks are beautiful, mysterious, and become collectibles for many kids. One of the appeals to rocks, is the child’s ability to work and search for them. 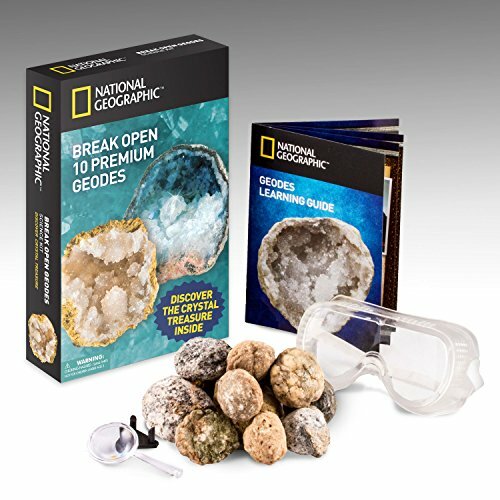 These geodes by National Geographic allow kids to discover their own beautiful gems through a little hard work. These geodes are meant to be broken open, to discover the amazing crystals inside. The set comes with 10 geodes, which can be various sizes and shapes. It also comes with a display stand, safety goggles, and a magnifying glass. It even comes with a 16-page learning guide to help children understand how geodes are forms and about the many varieties in the world. With a hammer, some elbow grease, and some supervision for the little ones, children can excavate for their own crystals. This geode set is suitable for children of at least 3 years. 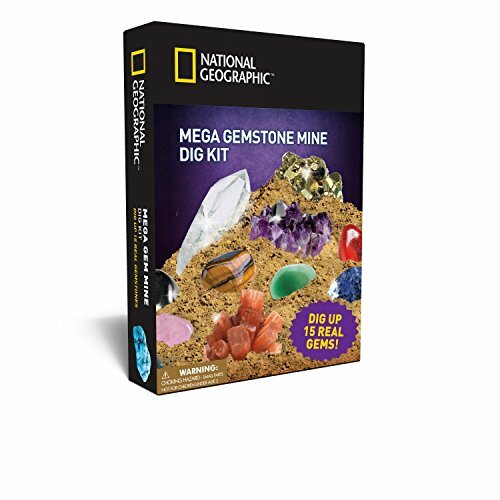 Just like the geode set, this gemstone kit by National Geographic allows kids to be little archeologists. It gives children of many age groups the opportunity to dig for their own rocks and gems, by use of a real mine. And although the recommended age for use is between 6- and 15-years of age, younger children can find this fun with a little help. Children can learn about archeology, science, rocks, mining, and more. Plus, they get to keep their own collectible gems. The Mega Gemstone Mine comes with everything necessary for an amazing dig. It comes with a 16-page learning guide, which helps kids identify rocks/gems and teaches them how they are formed and mined. 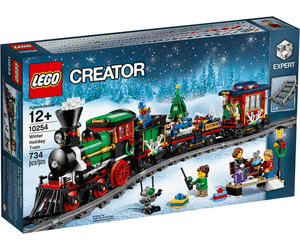 The set comes with every tool needed, including a chisel, brush, magnifying glass, and a dig brick. Each dig kit comes with 15 various, real gems, including quartz, obsidian, tiger’s eye, amethyst, aventurine, pyrite, and more. Kids can start their own rock collection, share their findings with friends, and see what it’s like to be a real scientist. Most children are interested in science and everything related to it because it is fascinating to them. They are curious beings, trying to figure out how the world works around them. Science allows them to answer these questions and a fun, non-invasive way. Magnets are a part of science that has always fascinated kids, because they can use their imagination and creative skills. This magnet set has everything your child needs to learn about magnetism through experiments, games, and fun. It comes with all the necessary pieces and instructions to create interactive, magnetic objects like a wand and a Super-power Horseshoe. Kids can also make a racer, yacht compass, or dangler. There are also activities like fishing, to further the fun. 4M’s Magnet Science Kit comes complete with detailed instructions, and numerous magnetic pieces to complete each project. 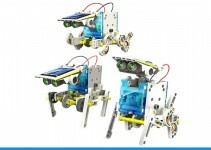 It is recommended for children 8-years-old and older, though many younger children can complete the projects with help. The Jr. Glow Stomp Rocket is recommended for kids above the age of 3, so most kids can find incredible fun with this amazing gift. The Stomp Rocket teaches children about science, flying, engineering, and more. And the best part? These rockets are 100% kid-powered, so they don’t just keep little hands busy; they keep every part of their body busy. This set is an ideal gift for busy, active kids who are also fascinated by the world of rocketry and science. 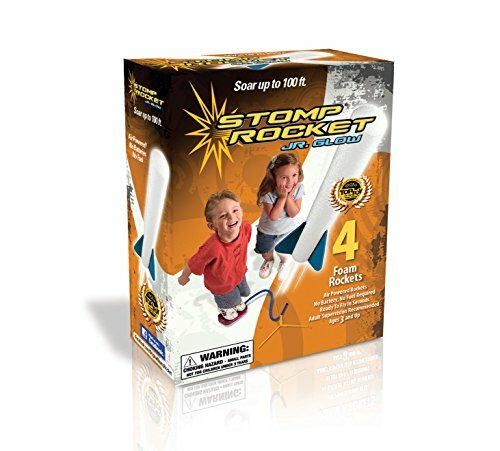 The Stomp Rocket Jr. Glow set comes with 4 Glow Stomp Rockets and a Stomp Launcher. The 4 rockets can be placed on the launcher, in which children must run, jump, or stomp to launch them. When these rockets are launched, they can reach an amazing 100-feet in the air. They are made from foam, so they are completely safe. They even glow in the dark, so they can be played with at any time of day. This set can teach kids to have fun, but also give them knowledge about flying, aerodynamics, rocketry, and more. This STEM-related activity is rated for kids 8-years and above, but smaller children may be able to do it with adult supervision. Kids of all ages typically enjoy putting things together, using technology, and using science to create new outcomes. 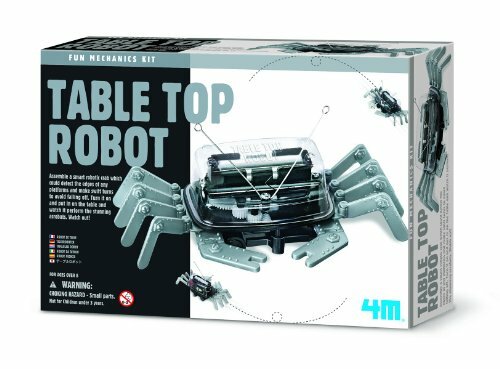 This table-top robot allows children to build their own working robot crab, which helps teach them the basics of robotics. And with this set, no prior science/robotic knowledge is required. The set comes with easy-to-read instructions and all the necessary parts to put together the robotic crab. After the crab is assembled and the battery (not included) is installed, the crab can scuttle under its own power and change direction when an obstacle appears; all children have to do is assemble the crab, place it on a flat surface, and watch it perform aerobatic tricks. This cool robotic crab can even detect edges to prevent itself from falling off. Not only is this gift educational, but it can also be a kid’s proud companion. 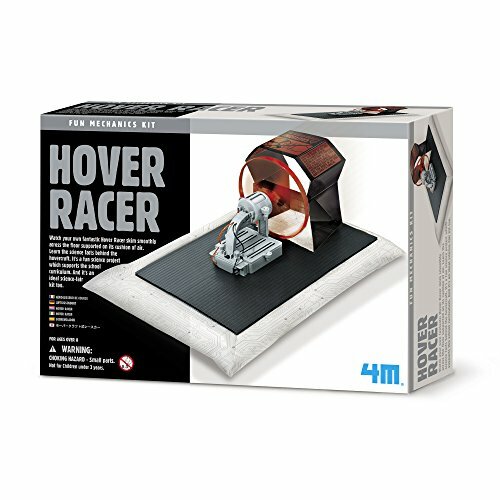 Another great find by 4M, this Hover Racer set teaches children about the science behind hovercrafts. Kits like these spark kids’ interest, and allow them to learn through hands-on fun. 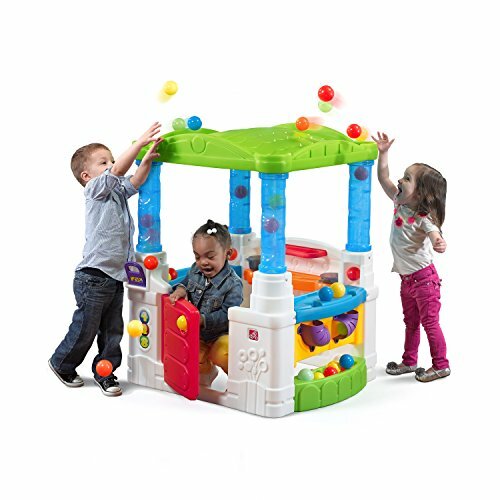 This set encourages scientific learning, fosters curiosity, and challenges a child’s imagination. 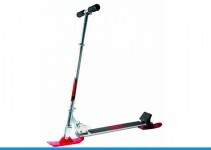 It is designed to work best for children over the age of 8, complete with safe and easy-to-use materials. The included instructions are designed for children’s eyes; making it easy for kids to put together the Hover Racer themselves. Included with the kit is everything a child needs to create their own hovercraft. This racer can skim smoothly across the floor after it is completed, by the support of its own cushion of air. Completely science driven, the end-result is fascinating for kids. In addition to simply being fun and educational, this Hover Racer kit can double as the ideal science-fair project. Children of many age groups can learn about air-technology, mechanics, engineering, and more with this set by 4M. 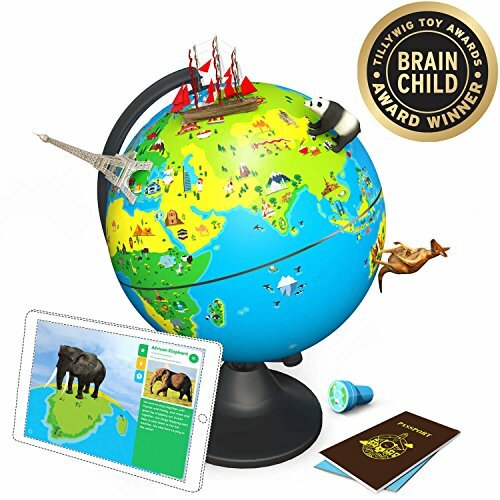 Designed for younger children aged 4-10, the Shifu Orboot is an educational, augmented reality-based globe that takes kids on a journey around the entire planet. This STEM-based toy is fun, easy-to-use, and extremely educational. It is beautifully-designed, complete with amazing details and color. In order to use Orboot, children will need access to the Orboot app. The app is free and available on most smart-devices. The Orboot set comes with the 10-inch globe, stamp, passport, flag stickers, and an extremely helpful guide. It builds kids’ knowledge of animals, weather, cultures, inventions, maps, and more for areas all over the world. In addition to fact-based learning, it offers kids the opportunity to develop linguistic and cognitive abilities. Orboot encourages children to discover on their own, as its music, voices, and content are completely engaging and interactive. 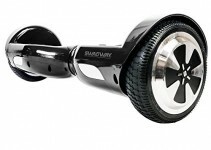 This is simply one of the best science gifts and toys for kids between age 4 and 10. 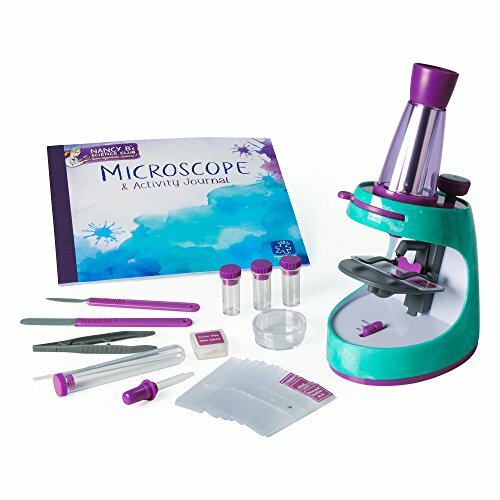 Although it may appear to be geared towards girls at first glance, this microscope and journal set is great for both boys and girls between the ages of 8-11. It gives children hands-on science experiences through real-life journaling activities. Kids can follow the activity guide to pursue their natural love of science, through various experiments provided by the kit. The provided journal not only teaches kids science facts, but also develops their scientific reasoning and self-discovery skills. Included with the set is the dual microscope, 22-page activity journal, and a 26-piece scientific tool set. The microscope can magnify up to 400x, and is built with both light- and dissecting-capabilities. The scientific tool set comes with everything a child needs to collect their specimens, view them, and find conclusive information. Through exploring and discovering on their own, children can be introduced to the scientific method, and encouraged to explore further. 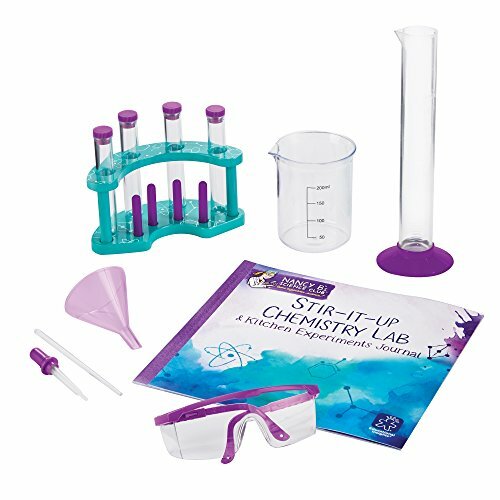 Another great choice by the Nancy B’s Science Club, this chemistry lab is something every little scientist needs. The set comes complete with lab glasses, 4 test tubes, beaker, graduated cylinder, rack, funnel, dropper, and stirring rod. In addition, there is a 22-page activity journal loaded to the brim with experiments for your little scientist to try. These activities are engaging, involve hands-on influence, and also involve writing prompts. The Stir-It-Up set is designed for kids 8-years of age and older. It supports STEM-based learning, and teaches them about molecules, atoms, density, the scientific method, and scientific variables. These fun activities can include (but are certainly not limited to) making lava in a bottle, creating color-change, and extinguishing flames with invisible gas. Through extreme fun, young kids can build both their scientific knowledge and confidence. All they need is a few ingredients from the kitchen to complete their Stir-It-Up set.